When a circus elephant goes missing on Detective Inspector Crombie's watch, he immediately thinks of Wren and Rhyllann, who have to his mind made a career out of being the collective bane of his existence. And his instincts are correct: the Celtic Cousins HAVE been up to something--but when Crombie finds out what it is and why, he runs into resistance not only from his immediate superiors, but also from the corridors of power in Whitehall itself. Contains adult humour and some strong language. Just over 40,000 words. nb. All three Celtic Cousin adventures: A Raucous Time, A Ripple in Time and this title, An Explosive Time are available in an omnibus edition titled Time after Time after Time. The third in the 'Celtic Cousins Adventure' series and once again, Julia Hughes has delivered the goods. Wren, Rhyllann and Detective Crombie are back for a London adventure and this time, they have a rather unusual friend called Alfie. We have a circus, a disappearing elephant and some sinister villains who will stop at nothing to stop Crombie from getting to the truth. 'An Explosive Time' does exactly that, it explodes from the page give the reader an exciting read and a gripping finish. The plot and the pace keep you flipping the page for more and now that the characters are established, this third volume allows us to get to know Wren, Rhyllann and Crombie like they are old friends. A well written book from an author who just keeps delivering. 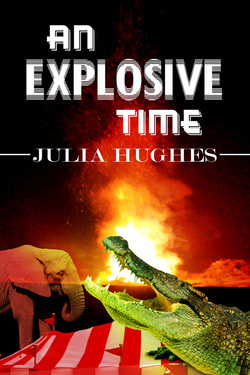 (Click here to read this and other reviews on Amazon.co.uk) Outside the United Kingdom, reviews samples and downloads of An Explosive Time and other ebooks by Julia Hughes can be obtained at Amazon.com.